You can start that organic lawn with seed, or you can go the fast way and have an instant lawn by laying down sod. You can start that organic lawn with seed, or you can go the fast way and have an instant lawn by laying sod. You will spend more money when laying sod as opposed to seeding, but you will a green yard rather than a lot full of seed, manure and hungry birds. Organic lawn care is the smart way to save money and protect the environment. And, it can produce a more attractive lawn. Compare short, thirsty-looking grass to longer, luxurious grass that looks like a carpet on your yard.Sod is turf that has been cultivated on a farm that is dedicated to growing grass. After about a year to 18 months, it is cut and rolled up like carpet. It is then transported to its destination to be laid out on soil in the same way that carpet is laid in a home. The recipient may be a homeowner, or it may be a business such as a golf course. The first step to laying sod is to prepare the soil. A thriving organic lawn needs to have advantageous insects and microorganisms. These will protect the sod from diseases and harmful pests, and they will help the grass to get the most nutrients from the soil. These beneficial creatures will come from compost. If your home is new, and you are starting your landscape from scratch, you should mix compost in with the top three or four inches of soil in a 50/50 mixture. If you already have an established lawn, you can add the compost as a top dressing. If the latter is the case, just add the compost by shoveling it around the yard evenly at about 1/3 inch deep. Then water it to activate the microbes. Both methods will help the sod take root and grow to be a healthy lawn now and in the future. You can install sod in a couple of ways. In some parts of North America, installers cut round plugs out of the layer of sod, and then plant the plugs in the ground about six inches apart. 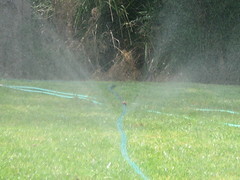 The grass will start to send feelers out to find water, which causes the plugs to grow together to cover the entire lawn. This is slower than laying the sod in a full sheet, which would produce a full lawn instantly. To lay rolls of sod, you need to compact the soil and make sure the soil surface is flat and evenly graded. You do this with rakes and a sod roller. A sod roller looks like a sideways 55-gallon drum with a handle. You fill it with water to make it heavy, and then roll it over the soil to remove humps and even out dips. This is a very important step to make sure that the sod can root everywhere thus avoiding browned out areas, so make sure the ground is flat and smooth, no matter what the grade, when you are done. It is now time to lay the sod. You want all the rolls of grass to go the same direction, so it is good to use the foundation of the house as a guide, and have the rolls all run horizontal with it. Stagger the rolls in the same way that the brick is staggered on a brick wall. For example, on a brick wall, the blocks do not all run evenly in the rows. The seam for the mortar is about half way down a block on adjacent rows. Lay the rolls of sod the same way. After all of the rolls of sod are down, empty half the water out of the sod roller and go over the sod to help it come into better contact with the ground. When doing this, go in the opposite direction of the rolls. If the lawn is wet, wait until it dries before rolling it. After rolling it, water the entire lawn. is the trickiest part. You need to keep the sod moist for two or three weeks until it gets rooted into the ground well. However, if you keep it too wet, it may get a fungus. You will have to judge this by the weather, checking the sod closely every day, and by making an educated guess. A story about too much water: I had a client with newly laid sod who trusted the sod installer to set the water timer program correctly. Well, very soon that lawn started to emit a swampy smell (the soil had become anaerobic, no air) because the sod installer over-estimated the water timing effectively starting to drown the grass. The other problem here was that the homeowner did not check on his new sod regularly. All he had to do was walk on the lawn and he would have felt the sponginess of the sod. They immediately cut the water timer program way back and the turf survived! Most experts say to water it once or twice a day. The idea is to maintain the new sod in a pretty consistently moist state. Just be sure to keep an eye on it. The best idea may be to let it dry out just a little bit before each watering. When you let the grass get thirsty, it will force its roots to grow in search of water. Also this will prevent anaerobic soil conditions. Better yet, don’t water it at all! That is the most lawn eco-friendly you can be. When your hot dry season rolls around, that’s July, August and early September here in zone 6 New England, un-watered grass can go dormant. It will fade in color, appearing light green or tan. That doesn’t mean it’s dead, it’s just gone dormant and will start growing again when the weather cools and the sun angle dips. You can’t do this with a new lawn. Wait five years until it is truly established and then give up watering. Once you are finished laying sod, you can start taking care of it using organic lawn care methods. That means keeping the grass groomed, but not too short. Keeping it at three inches rather than one inch will save you a lot of time, water, and expense. Watering it less often is recommended, too. Wait until the soil is dry before watering. The grass will let you know when it is time by turning dull green instead of being bright or dark green.